The Pennsylvania National Horse Show has been held at The Pennsylvania Farm Show Complex & Expo Center, in Harrisburg, PA throughout its 70-year history. In 1997, the site included 60 acres of parking and nearly 14 acres of exhibition space. In 2001, work began on a $76 million dollar expansion which enlarged the space under roof to 24 acres and added the new indoor 134'x250' exercise ring. The Pennsylvania National Horse Show enhances the facility by installing stabling, the inside schooling arena and vendor spaces. 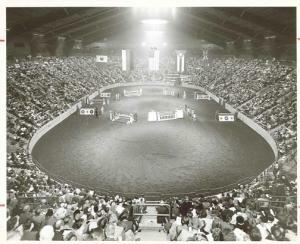 All competition is held in the main arena (120' x 240') allowing the entire show to be under one roof. Located in Pennsylvania's capital city of Harrisburg, the Farm Show Complex is just minutes away from over 8,500 hotel rooms making it a convenient facility to host the Pennsylvania National Horse Show. The local region offers a variety of historical sites, attractions, dining and shopping options.